It must be difficult to stand out in videogames when your game is built around shuffling flesh eaters. It sometimes feels like every other game has something to do with zombies, and this was true even before TV’s The Walking Dead’s success inspired legions more. March of the Living might share that pop-culture inspiration, but its videogame influence means it doesn’t appear to be just another rotting cadaver. Speaking of the many, many games about dead cannibals, we’ve compiled a list of the best zombie games on PC. 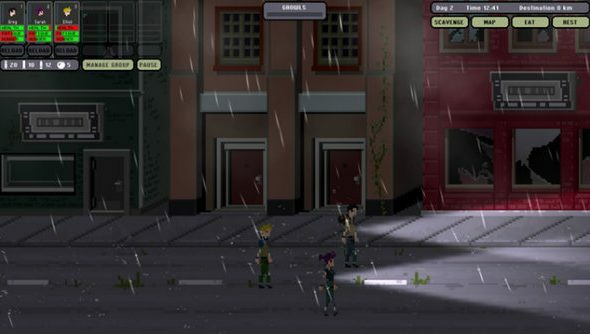 March of the Living has more in common with space roguelike FTL than any brainless zombie blaster, and that’s because the developers cite that as an inspiration of equal importance to AMC’s hit comic adaptation. “The world is crumbling and the dead are roaming, but a glimmer of hope remains. A safe place where humanity can start over, protected from the hell this world has become. This is your destination. In the game you’ll manage a group of six survivors as they trek through a procedurally generated apocalypse, random events popping up along the way and forcing you to make tough choices. There’s also pausable, tactical real-time combat, trading, scavenging and other surprises. It sounds ace. If you agree, you can vote for it on Steam Greenlight.